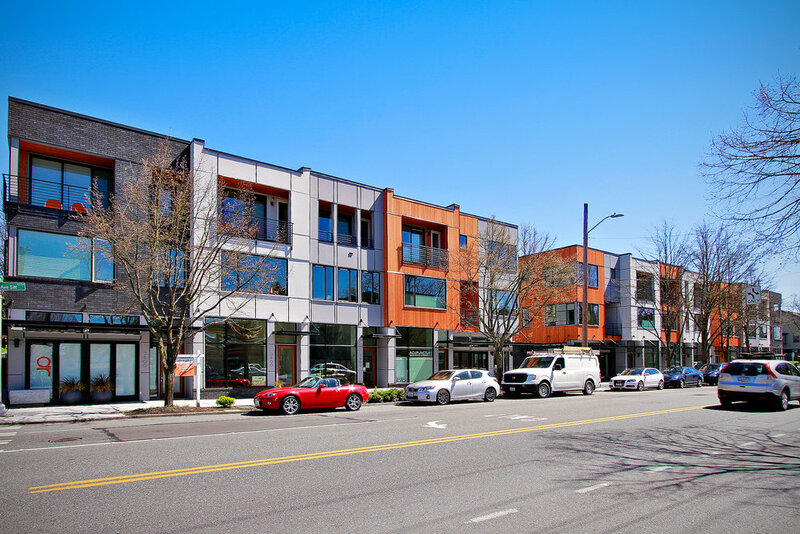 Rally has revitalized the West Seattle spine of California Avenue. Occupying the former site of a stand-alone restaurant and parking lot, the location was one of many struggling to strike a balance between the commercial promise of this avenue and the single-family neighborhoods beyond. Through conscientious material choice and careful composition, Rally communicates village character and provides the surrounding area with necessary cohesion. The use of steel and brick at the storefronts, as well as substantial glazing, provides more commercial character along California Avenue. Transitioning through the intimate courtyard towards the residential townhome units, a bubbling fountain and multiple spaces to gather provide respite from the city beyond and an opportunity to connect with neighbors. The townhomes flanking the courtyard incorporate similar materials as the California Avenue facade, but have stoops and small raised patios that add residential character and provide opportunities for interaction among the live/work and residential neighbors. Within the townhomes, open living areas leading to large roof-top patios allow residents to feel truly at ease in their space. Rally provides a seed for the future character of this area and lends a vibrant mix of density and commercial activity.